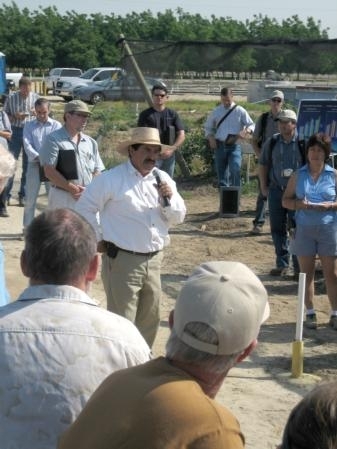 Manuel Jimenez speaks at a previous Kearney Ag Research and Extension Center blueberry field day. On Wednesday, May 18, Jimenez will lead a tour to small and large commercial berry farms and packing facilities. Discussion topics include blackberry sunburn prevention, blackberry trellising systems, blueberry field design and layout, soil and water acidification, irrigation scheduling, harvest practices and blueberry packing and cooling. A blueberry meeting on Thursday, May 19, features presentations on world production systems, blueberry nutrition, frost protection and blueberry market outlook. Following lunch, participants adjourn to visit the research plantings and industry exhibits. For more information about the blueberry meetings this week at Kearney, see the flyer.